Whether you own a small cruising yacht or you`re the captain or chief stewardess of a mega yacht or superyacht, hosting guests; bed cleaning, stain removal from mattresses, and general mattress cleaning and sanitizing are important to make guests feel comfortable. Mega Yacht Cleaning offers full service mattress cleaning and sanitizing services for your yacht. Our bed cleaning system uses a combination of high frequency vibration, turbo suction and UV sanitizing for an unbeatable cleaning. This is the best way to get a deep clean and thoroughly remove dust mites. 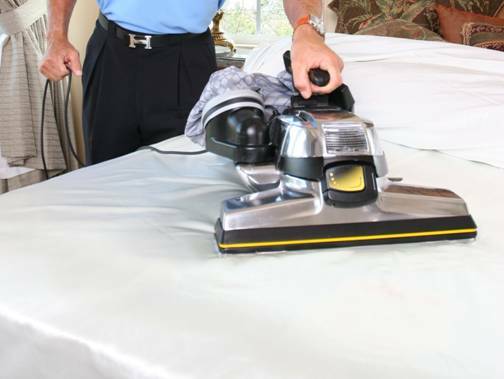 We treat bed and mattress surfaces for soiling and stain removal so they look great again. We come out to your vessel when it is convenient for you; you never have to work around our schedule. We are licensed and certified to work in all of the marinas in South Florida. Before any work is done, we provide free estimates and a list of references. Call Mega Yacht Cleanings at (954) 448-8899 and find out more about all of our bed cleaning plus mattress cleaning and sanitizing services available.